All these traveling reminded me of a particular McDonnell Douglas DC-10 flight from San Francisco to Tokyo. I was originally supposed to fly to Seattle first for the connection to Tokyo when my flight up was canceled at the last minute. As a result, I was put on an alternative flight from San Francisco direct to Tokyo instead. Problem is that I lose my upgrade seat on this flight. What pissed me off even more is that I don't get a refund for the frequent flyer miles that I plonked in for the upgrade. Yup, 30,000 miles down the drain. Well, the gate agent was aware of my unhappiness and made me a deal. 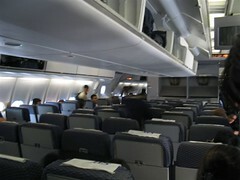 Although I get bumped down to Economy Class, they will give me an entire middle row of 5 seats at the back of the plane. I happily accepted the deal, given that it was better than nothing anyway. So when I boarded the plane and happily strolled to "my row", I was dismayed to see a Japanese guy already buckled up at one end of the row of 5. So ok lor... 2 person share 5 seats so logically, each person get 2.5 seats right? Well, not really coz you can't really get half a seat right or our heads will be touching. Sekali, his dandruff pass over to me or worse, his kutus all migrate over to my head then how? So the law of the jungle is that each person will get 2 seats with the middle one as the DMZ aka No Man's Land. As soon as the flight finished serving dinner, I horizontal liao but because I got only 2 seats, I had to huddle up in a fetal position. 30 minutes later, I sneaked a peek at the Jap guy. Eh? The Jap guy still guai guai sitting in his corner seat. Ok lor, lim peh act blur liao... slow inched towards the 3rd seat and stop just before the halfway mark. That way, if he complain, I can say that each person 2.5 seats is fair what. Then another 15 minutes later, I peek up at him again, he has dozed off. Hor seh liao... lim peh slowly inched forward and took over the entire middle seat. Then I wait another 15 minutes. Hmm... still no movement from the Jap guy. We slept all the way though and was only awakened when the Captain spoke over the PA to announce that we are about to land at Narita airport. I think that was the only time that he realised that I kapoked all the 4 seats. if he was a singaporean there would be alot of jostling and complaining...tio boh? see, like i said before, shorter better, right? if shorter, maybe you occupied only 3 seats (horizontally). haha! grrrr. i wanna fly here fly there too! But no biz class treatment (ice cream and ramen in the middle of the night) leh! nadnut: Don't grrrr lah.... fly long haul is really tough. Especially this is my fifth trip to the US this year. Imagine having to deal with the stupid jet lag every 2 months. Lynne: Well, yes and no. Granted that it will be back to plastic fork, knife and tray. But undisturbed sleep trumps over everything. Haha he Japanese mah. Very refined one. Unlike Singa-complain-poreans. akk: I cannot lah... either kena poke eye or poke backside not my cuppa tea. Vandice: You definitely had the better deal there with the kawai-ne stewardesses. bah. i juz realised the rollover of my url is redbull addict alert!